Joe Wells, of whom it has been said. : Leisure. I wish I could say I am writing this at my leisure but sadly not, I am writing this firstly as the your-daily-word-prompt and also as an exercise to see if I can convince Wordpress to play nicely with Blogger. The image I have uploaded is just to give a feel to the word leisure for surely to an Englishman an afternoon asleep in his shed having read a good book with the radio tuned to Her Majesty's Radio Four is to many the peak of leisurely activity. 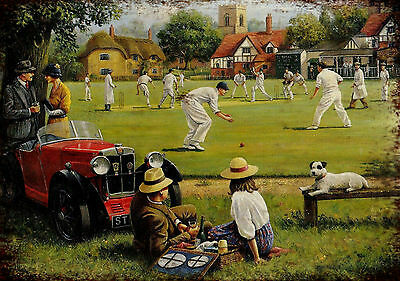 Yet again another highlight of leisurely pastimes especially for the British is a day watching cricket on the village green, to an Englishman there are few things as satisfying as the sound of leather on willow and then topped off with a couple of pints of beer in the pub afterwards. However much as these wonderful images of leisure are a feast for the eyes, the main purpose of this blog is to endeavour to make the link I have attached below go to the place I intend it to go to and to this end it is the only pingback in this post. If this doesn't end up going to your-daily-word-prompt it will confirm my suspicions that Wordpress and Blogger do not have the ability to play nicely together. A little light relief from Brexit. Your Daily Word Prompt, Besmirch. The Weekend Writing Prompt #96 Seashore.